Got this a few weeks ago. I think it will replace my mini 14 and become my Truck Gun. Will not do any mods other then optics. WendyZXZ, Thewelshm, OzarkMarine and 5 others like this. 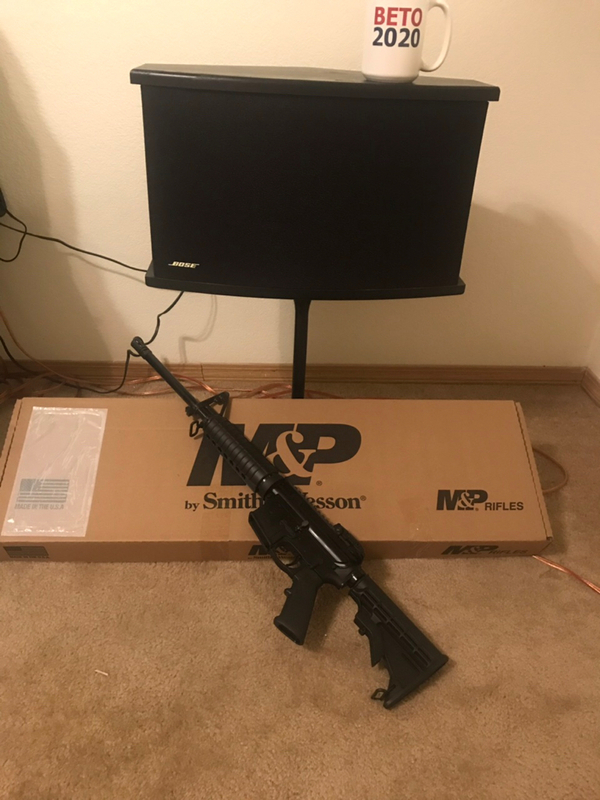 Looks like a very nice new Smith rifle! jeepnut, Curt360, joselectrician915 and 1 others like this. joselectrician915, Curt360, bearcat6 and 3 others like this. Beto 2020? What rifle all I see is that lousy cup. That's a joke right? Be careful what you wish for there joselectrician. Let’s go out there on a limb and say that Beto wins in 2020, not at all likely, but let’s say he does. Guess what, he and his party will do anything and everything to ensure that you won’t have that new semi-auto as your truck gun or any truck gun, or bedside table gun or carry gun. Got it? bearcat6 and Curt360 like this. Truck gun? No. Gun truck!